In this photo released by the Extraordinary Chambers in the Courts of Cambodia, Khieu Samphan, right, former Khmer Rouge head of state, sits in a court room before a hearing at the U.N.-backed war crimes tribunal in Phnom Penh, Cambodia, Friday, Nov. 16, 2018. The international tribunal to judge the criminal responsibility of former Khmer Rouge leaders for the deaths of an estimated 1.7 million Cambodians opened its session Friday to deliver its verdicts on charges of genocide and other crimes. 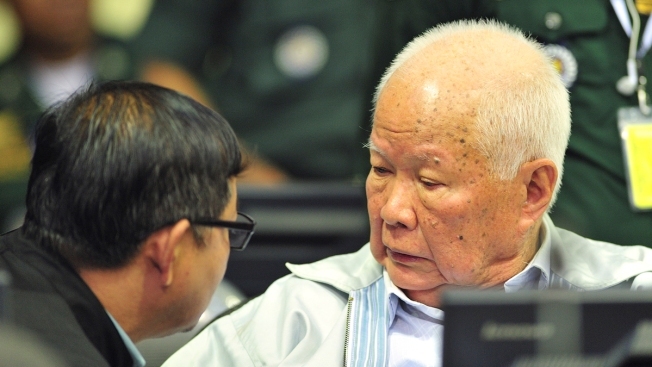 The last surviving leaders of the communist Khmer Rouge regime that brutally ruled Cambodia in the 1970s were convicted of genocide, crimes against humanity and war crimes Friday by an international tribunal.